WeCareJourney is dedicated to the treatment of spinal muscular atrophy (SMA), the number one genetic cause of death for infants. An SMA diagnosis can be overwhelming, and we give patients and families the information and resources they need to live active, engaged, and hopeful lives today. We are committed to respecting and fostering diversity and inclusion in the people we help. To champion C.A.R.E and support for families with SMA & disabilities. Caring and Connecting families with SMA and disabilities to support by taking Action and creating Awareness, promoting Readiness and Responsibility, and by Empowering affected families through Education. Our programs provide tangible support for families affected by SMA, easing the difficulties of an SMA diagnosis, and showing each family that they are not alone and that there is hope. Our family support programs also hope to build and maintain a strong and unified community. with medical talks with overseas SMA expert doctors. with standing frames, to maintain healthier bone and internal organ development, prevent some muscular issues, and some psychological benefits. the Young Adult program which gives them a platform to discover and access opportunities for personal and professional development. 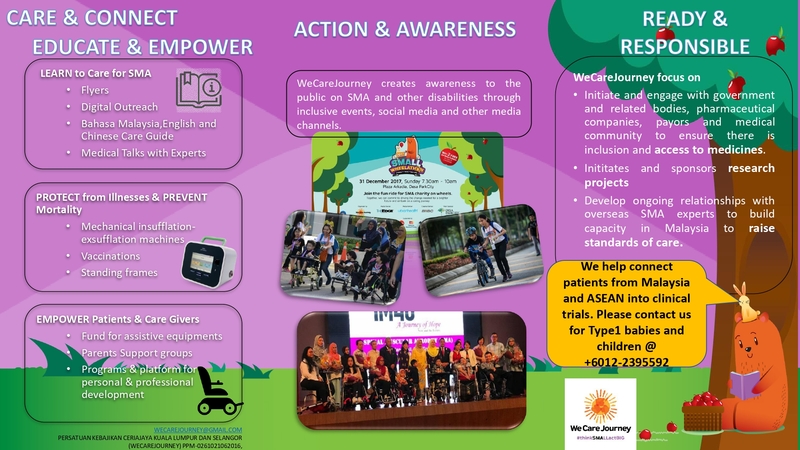 WeCareJourney regularly acts to raise awareness on SMA at digital and traditional media, and at real world events and campaigns which we participate in or organise ourselves. Where possible we provide platforms and give opportunities for patients and care-givers to have a voice. To-date, we have reached over a million people, often with the support of partners in government, corporate, media and individuals, to spread awareness. It is equally important to help prevent SMA, and by referring people who wish to find out more, to carrier testing, affordable genetic counselling and be directed to specialists who can advise on ways to reduce the risk of having a baby with SMA. On December 23, 2016, the United States Food and Drug Administration announced that it had approved Spinraza, the first-ever approved drug therapy for SMA. The time that have followed this ground-breaking announcement have been filled with celebration and hope for the future. But it has also been a time of frustration with many countries fighting to get access and funding for this costly drug. 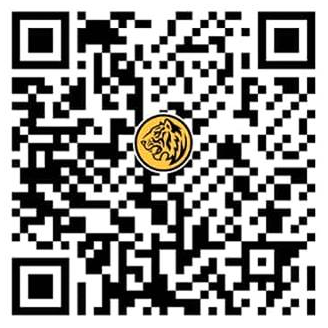 The situation in Malaysia remains extremely difficult. We are committed to advocacy and to motivate stakeholders to take proper action to uphold the right to life and resolve the inequity. At the same time, we drive hard to strengthen relationships with relevant biotech and pharmaceutical companies to run clinical trials here, or to get Malaysian patients recruited into trials overseas (one has been successful). We believe that all stakeholders share common objectives and should collaborate, and we hope to catalyse this “can-do-together” attitude by continuously championing for better care and support with the programs we run.